This is something all of us should consider. 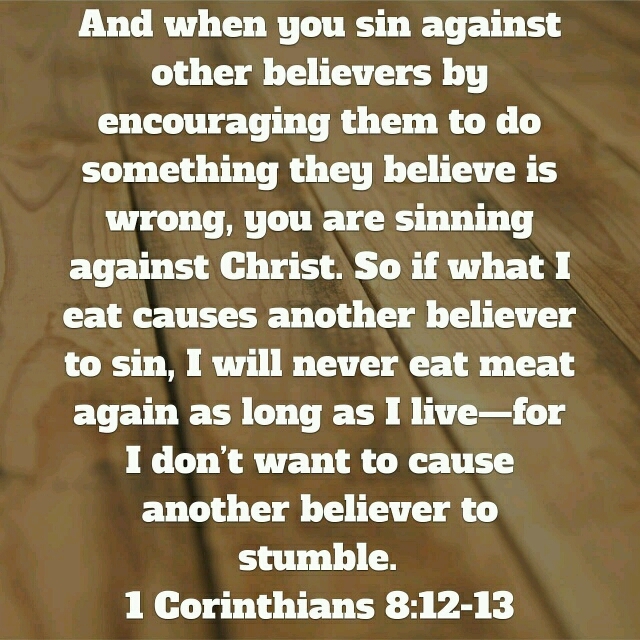 Paul was using meat as an example, but basically he was refereeing to anything that might cause another believer to stumble. We tend to use the excuse like, I have a right to do it or the bible doesn’t say it’s a sin. We try to package things up the way our conscience would be clear. The truth is if we are doing something in front of a believer that might cause them to stumble, we shouldn’t do it. A perfect example is drinking. The bible doesn’t say you shouldn’t drink but if you are drinking in front of a recovering alcoholic then you might likely cause that person to stumble. We must realize that are actions doesn’t just affect us, but they affect those around us. The next time you do something, make a conscience effort to decide if what you are doing well cause someone to stumble. Three days, two nights at the Vatican hotel. One of those hats (referring to the bishop’s hat). It looks as if David will get away with all of this. But he doesn’t. God sends his prophet Nathan to confront David by telling him a story about a poor man with one lamb. David knows something about sheep and shepherds, so he listens. Nathan says that the poor man has a rich neighbor who needs to slaughter a lamb to feed a guest, but instead of taking one of his many sheep he steals the poor’s man’s one lamb. Join us Sunday, May 31st as we continue The Story. This Sunday, May 24th at 10:30 am We are the Monks will be with us in concert. Imagine the scene: a scrawny sixteen year old shepherd boy takes out a 9’9” tall giant with one rock and a sling. You may not have a gigantic giant taunting you to come out and fight. But you are probably facing a few giants of your own. Giants like the stack of past-due bills glaring at you. Like the divorce papers waiting on your signature. Or the depression that looms over you like the Hulk. It could be low self-esteem or insecurity or child abuse in your past. But you have your giants. And so do I. And we would do well to learn from David. David was God-focused instead of giant-focused. He mentions Goliath two times and God nine times. He knew the giant was there and recognized his presence. But his thoughts were twice as much on God. That focus led him to confront his giant rather than run away. For forty days Goliath continued to challenge Israel’s army. And for forty days everyone hoped he would just go away. But giants don’t typically go away until we face them. So David stepped into the gap and slung one well-aimed stone at him. It helps to have someone in your corner that believes in you. David had his Jonathan. You need yours. You need at least one person who believes in you and that also believes in God. Someone who can encourage your faith—give you courage—when you most need it. And you will need it. Because after you slay one giant, there will be more. You may wonder why David picked up five stones from the river bed. Was he afraid he might miss? Not likely. He was skilled in his use of the sling. 2 Samuel 21:18-22 hints that Goliath may have had four brothers. David was ready. He could take on one giant. You might say he knew how to get a head of his giant. And then he was ready for more. And you can too. Just follow the shepherd from Bethlehem. Join us Sunday as we continue The Story. Ever since Peter Stuyvesant visited the Palace of Versailles the world has had a distorted view of itself. Peter was the governor of New Amsterdam—later to be renamed New York City—beginning in 1647. He was visiting France to discuss colonial land agreements. While at Versailles he was awed by the Hall of Mirrors. Peter was determined to bring a similarly amazing showcase to his city. In 1651 he founded the Peter Stuyvesant’s House of Mirrors. He charged one Dutch gulden for admission. This house of mirrors eventually morphed into what we know as a Fun House of Mirrors seen at many carnivals. For a few tickets the fun begins by walking into a maze of mirrors, both convex and concave. We amuse ourselves by looking at distorted images of our figure. Today you don’t even have to go to the carnival for this experience. A laptop with a webcam and a silly photo feature will allow you to take a picture of yourself that you can manipulate to look odd. Many people often ask the question, “What does God look like?” The question we all need to ask ourselves is do people see God in us. Join us this Sunday at 10:30 am as we continue “The Story”.